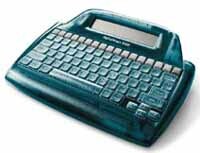 The AlphaSmart 3000 is a portable and affordable computer companion designed to enable users to type, edit and electronically store text, as well as practice keyboarding, without having to be at a computer. It is compatible with any computer, Macintosh or PC, and with most printers. With this device, an entire classroom of students can write or take notes from anywhere and later transfer their files into any application on any computer, or print to most printers. They first launch any application on a computer, connect the computer companion using the cable, and hit the "send" key. In addition, the device offers an optional 100% error-free IR (infrared) interface that allows wireless transfer. With this option, users point the companion towards the IR transceiver and hit the "send" key or connect the printer cable and press the "print" key to print directly to a printer. In addition, the device features a new SmartApple architecture capable of extending its functionality with applets. Applets are mini-software applications that can be downloaded to the device to extend its functionality for keyboarding, templates, email and more. The device stores up to 100-pages of single-spaced text in eight files, weighs 2-lb, and runs on three AA batteries for 200-500 hours of typical use. Features also include a kid-proof USB computer port, a full-size keyboard and a four line text display, cut/copy/paste functions, a built-in 70,000 word spell-check, sticky keys, key repeat control, and international character support for six languages. The device also includes Get Utility software that allows users to transfer text from any computer to the companion. AlphaSmart, Inc., 20400 Stevens Creek Bouelvard, Suite 300, Cupertino, CA 95014. Tel: 888-274-0680 or 408-252-9400, ext. 135. Fax: 408-252-9409.